Jaellyn, a 7th grader at Indian Springs Middle School, visited Milestone for the first time in September. 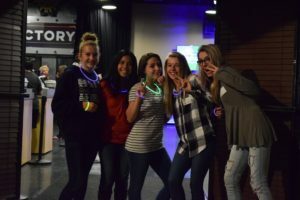 She was invited by a friend to our Wednesday night Elevate service for students. That night she decided to give her life to Christ. So excited about what she felt in her heart, she joined a weekly middle school small group and started volunteering on the “Greet Squad” every Wednesday. Jaellyn didn’t know what to do except be at church every time the doors were open. 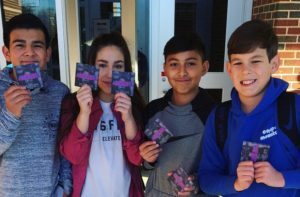 When she heard that Elevate was doing a special series in February, she immediately began inviting everyone she knew at school–handing out over 100 flyers herself! 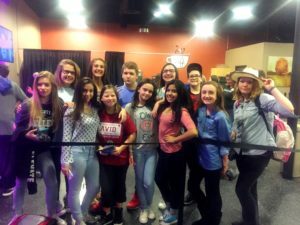 Last night she brought a group of friends to Elevate and some of them decided to pray to accept Jesus. Her influence and passion for what she has experienced herself led to life-change in others. Jaellyn will be getting baptized at our next Baptism Weekend on February 18-19 and will be inviting her family to come to church for the first time! The transformation in her life is truly because of the love of God she has experienced. When we experience this love we can’t help but share it. His greatest desire is for us to receive the life He’s created us to live and then join Him on His mission to reach others. That is AMAZING!!!! So much life change in one girl! Well done, Jaelynn!! God is doing awesome things in you and through you! Love this story so much, and so proud of Jaellyn and how she is growing in her relationship with Jesus! Impressed by a young person grabbing hold of that big power in Jesus! Wow, Jaelynn! I think of 1 Timothy 4:12, “Don’t let anyone look down on you because of your youth.” Way to set the example, so proud of you! Amazing story!! Way to be an ambassador of Christ, Jaelynn! This is the target! Love this story, and proud of you Jaelynn!! Keep making an impact! I can’t wait to meet you Jaelynn. So proud of your decision and boldness to make a difference in this world through Christ!